Introducing the new and improved Tru-Form™ Media by Adesso. 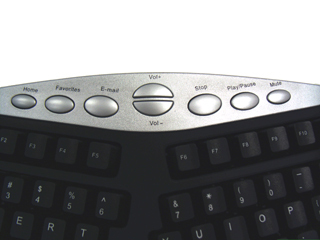 Its contoured, split key design for ergonomic comfort. The Adesso Tru-Form™ Media has multimedia keys that make this keyboard a comfortable, multi-featured keyboard that combines a host of Windows and Multimedia keys in a comfortable ergonomic design. Split, gently sloped shape encourages a natural hand, wrist, and forearm position for maximum comfort. Additional features include a built-in wrist support and a split spacebar. Split-key and 3D design conforms to your natural arm and hand positions, reducing tension in shoulders, arms and wrists. Discover the new Tru-Form™ Media, with one-touch buttons that take you directly to your favorite multimedia activities - navigate music and video clips, surf the Web, start many of the programs you use most, and more. With these 8 hot keys and a stylish ergonomic design, this keyboard adds dynamic features and vibrant looks to any desktop. Windows Vista Power Keys included. Dimensions (At greatest width/length): 19.25" x 10.75" x 2"